Registration for the 2017 U.S. Go Congress in San Diego is now open. The largest annual go activity in the United States — last year 650 attended in Boston — the Congress runs August 5-12 this year. Events include the US Open, the largest annual go tournament in the US, professional lectures and game analysis, continuous self-paired games, and all kinds of go-related activities from morning to midnight. 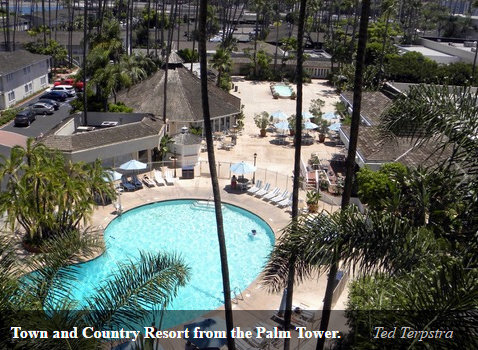 The 2017 Congress will be held at the Town and Country Resort in San Diego, California, which is right in the center of town. “The venue for go tournaments, lectures and game analyses, as well as hotel rooms and meals are all within a short walk of each other, no streets to cross,” says Congress Director Ted Terpstra. Lodging reservations most be done through the Town and Country Resort hotel via a link on the AGA page, not through the AGA. A special rate is available that way and is good for three days before and after the Congress for those who want to extend their stay in San Diego. Details on Congress costs are here. For those who select one of the meal packages, their food will be served on-site at the convention center under the supervision of the executive chef. Meal plan details are here. The Town and Country Resort is an 46-acre oasis near most of the tourist attractions in town. It is a quick ten-minute drive from downtown, the airport, the Pacific Ocean beaches, Seaworld, the zoo, Balboa Park and many other sights. People staying there have use of the three swimming pools and the gym. The Town and Country Resort has its own trolley stop and is contiguous to a bus terminal, an upscale mall and a golf course. “The San Diego Go Club is happy to welcome everyone and look forward to hosting a great US Go Congress,” says Terpstra.